“Mini Lights, Mini Lights, come out tonight. Mini Lights, Mini Lights, come out tonight. Mini Lights, Mini Lights, come out tonight,” we chanted in unison. Three times, just as the legend said we were to do. We waited for little green men to show. Nothing. Maybe it wasn’t dark enough yet; maybe they were somewhere else. Ask any long-term citizen of St. Pete and they could tell you the tale of the Mini Lights. The Mini Lights were short, green creatures that would go after people if they were out past dark. Their location is ambiguous; some say they live under the Booker Creek Bridge, some have seen them under Thrill Hill, and some have seen them in the Campbell Park neighborhood. I wasn’t familiar with the Mini Lights story, regardless of the fact I had been attending school in St. Pete for the past two years. My nature writing class, namely our reading of The Salt Creek Journal, was what introduced me to the story of the Mini Lights. I found the story to be a little “out there,” but the superstition made me laugh nonetheless. You don’t need to buy into the myth to appreciate the sentiment and cultural history behind it. But then again, if you don’t buy into it, I dare you to say the line three times in a row. 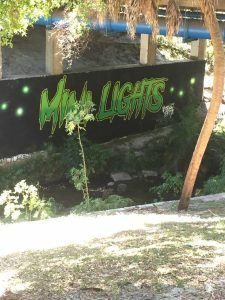 When our class got the opportunity to walk Booker Creek, we were fortunate enough to come across a mural dedicated to the myth of the Mini Lights. The mural may not fit the narrative of “nature” in the typical sense, but you could tell that the it blends right in with its surroundings, since the mural is painted in a spot where the Mini Lights are rumored to live. The man-made world and the natural world have been intertwined with one another for quite some time. Who is to say what constitutes as nature? Is it “pretty?” Is it untouched by man completely? If you would have asked me at the beginning of the semester, “Where is the nature in St. Pete?”, I would have told you that it was nonexistent. But through this course, by walking Salt Creek, visiting Boyd Hill, visiting Dell Homes Park, and walking Booker Creek, I’ve had a change of heart. Nature doesn’t have to be in pristine condition to be “true nature.” The natural world and the animals in it learn to adapt to their surroundings. Nature is nature, whether pristine or polluted. Nature will find a way to survive, even in the city. You can find nature in the city, you just have to be willing to look.